This 2.25 mile round-trip hike will reward you with a visit to beautiful Windsor Lake, tucked beneath striking peaks & ridges of the Mt. Massive Wilderness area. Don't let the low mileage trick you - this trail gains around 800ft. in the first .8 miles. Trailhead directions: From the west side of Leadville on Hwy. 24, take McWethy Dr. NW to Turquoise Lake Rd., drive west to Hagerman Pass rd. to the left, and follow it to the trailhead at Hagerman Tunnel. A beautiful ~8 mile round trip hike, this trail will take you through switchbacks lined with Spruce & Fir before bringing you onto a Plateau that offers great views of both Mt. Massive & the Cloud City itself. The end point of Native Lake is set in a peaceful valley primed for an alpine picnic. Direction to the Trailhead: From the traffic light at 6th St. and Harrison Avenue, follow Highway 24 south to mile marker 177 and turn right onto McWethy Drive/Lake County Road 4, across from the entrance to Colorado Mountain College. Follow Lake County Road 4 to the Turquoise Lake Recreation Area. Continue across the dam and along the south side of the lake. Turn left onto Forest Road 105/Hagerman Pass Road. Follow this road for 3.5 miles to the trailhead for Native Lake. Park here, the trail begins to the south of this parking area. Set in the Holy Cross Wilderness area, this 4.4 mile round-trip hike just off of dazzling Turquoise Lake will take you up to a Timberline Lake, a stunning spot that offers pristine alpine beauty and cutthroat trout for anyone interested in some catch & release. Directions to the Trailhead: From the traffic light at 6th St. and Harrison, follow Highway 24 south to mile marker 177 and turn right onto McWethy Drive/Lake County Road 4, across from the entrance to Colorado Mountain College. Follow Lake County Road 4 for 1.5 miles, turn right onto Lake County Road 9. Follow Lake County Road 9 for 1.5 miles. Turn left across from the large, paved parking lot (Leadville Junction.) Cross the railroad tracks and the Arkansas River. At the T-intersection, take a right (north) and travel along this paved road for 7 miles to the trailhead for Timberline Lake. This is it, Colorado's highest peak. 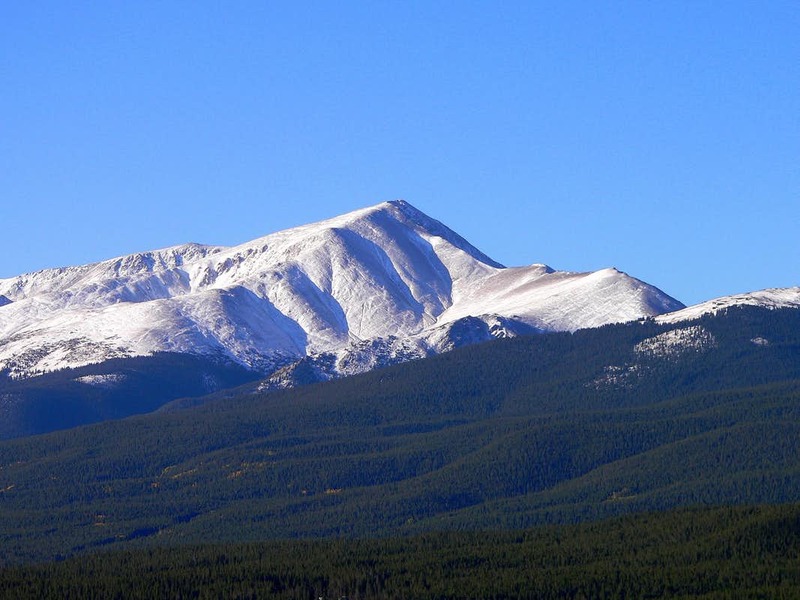 Measuring in at 14,433, a trek up Elbert will treat you to stunning views & exhausted lungs. The most readily accessible Northeast Ridge route is about 9 miles in round trip length & will take you up 4,700ft. of vertical gain. While not technically demanding, this mountain certainly doesn't mess around - you'll be breathing hard 5 steps onto the trail. Directions to Trailhead: From U.S. 24 just south of Leadville, turn onto Colorado 300 and cross the railroad tracks. Drive 0.7 mile and turn left onto County Road 11 toward the Halfmoon Creek. After another 1.2 miles, turn right on the dirt road to Halfmoon Creek. Drive for 5 miles to the Mt. Elbert trailhead on the left. The namesake of many storefronts in Leadville & the peak that dominates the skyline of Leadville. Only 12 feet shorter than Elbert at 14,421, the hike up Massive is arguably a bit more exciting with equally stunning views. The most readily accessible trailhead is right next to that for Mt. Elbert & is roughly 14 miles in round trip length with 4,500ft. of gain. Directions to the Trailhead: Exactly the same as Elbert but with .3 more miles on the dirt road. Barely a 14'er at 14,005ft., this beauty of a peak still packs a mighty amount of character. Known for its characteristic cross of snow in the springtime, shy personality (she's hard to view until you're actually on the trail), and striking, alp-like structure, a trip to Holy Cross is bound to make you feel at least a bit more like a mountaineer. The 12 mile round-trip hike nets 5,600ft. of gain (you have to climb back up over Halfmoon Pass after summiting), and the Class II boulder field just below the summit caps off the experience with a bit of manageable excitement. Directions to the Trailhead: From Leadville, take 24 north for 26 miles before turning left onto Tigiwon Rd. Drive 8 miles to the trailhead, which is almost certainly bound to be full. Oxford, Belford, Missouri, La Plata, Huron, Sherman, and the rest of the Collegiate Peaks are all also within easy reach of our doorsteps. Check out the official webpage of the 14ers here for more information. Perfect for an easy walk, bike ride, or any other non-motorized option you can come up with! This 11.6 mile paved path provides a great overview of Leadville & its rich mining history, with 6 miles of the loop traversing the Historic Mining District. The path also offers great views of the surrounding ranges & Leadville itself. Parking is available along Highway 24 to the west of College Road on the south side of Leadville. You can also park in Leadville and catch the trail at the intersection of Harrison Avenue and E. 12th Street. If you want to drive up to the higher parts of the trail to walk past the historic mining areas, you can drive up E. 7th Street to Road 3 or up E. 5th Street to County Road 1.